Last week temperatures in Chicago fell as low as -30 degrees as the polar vortex affected temperatures across large areas of the United States. 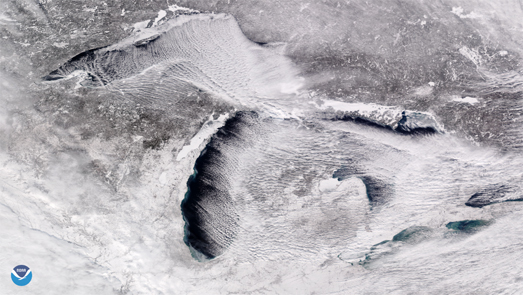 According to NOAA this cold weather has caused nearly 50% of Lake Michigan to freeze over. Asa Strong has used Planet to create a side by side comparison of Chicago as seen from the air in December and in January. The Chicago on Ice comparison consists of two aerial images of the city. In the right hand image you can see the affect that the polar vortex has had on Chicago, with the city covered in a blanket of snow and Lake Michigan covered by ice. NOAA has released a satellite image showing 'cloud streets' streaming across the Great Lakes. These cloud streets are caused when the warmer temperatures caught in the Great Lakes rises and hits the cold air above. This causes moisture to condense into cumulus clouds. These cooling clouds then sink back to the lake level. This rising and sinking motion creates this 'cloud street' effect that has been seen over the Great Lakes in this cold weather. You can view more recent satellite imagery of Lake Michigan on NOAA's MODIS Imagery pages.